Mark Damon stars in Ferdinando Baldi's well written Peplum Adventure. Alpha US R0 DVD. 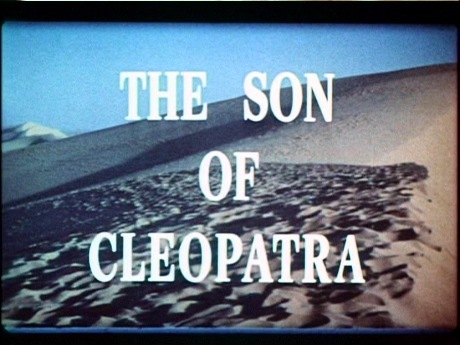 Co-written by director Ferdinando Baldi, Son of Cleopatra does take a while to get going and the slowly paced first half an hour drags a little with what seems to be a rather generic genre storyline - fortunately the script picks up considerably after this point, developing a surprisingly deep and erudite plot with some well rounded characterisation and a romantic theme which is key to the storyline and does not just feel tacked on. Action scenes are however somewhat neglected and despite having a lot of potential a couple of sequences in the middle - a horsebound whipping of El Kabir and a gladiatoral tornament - do feel a little gratuitous, the climactic skirmishes are much better integrated, leading to a fitting climax if an oddly disappointing ending with no big battle scene that the large build-up would have suggested. For once in a Peplum, the English language title and the lead character's identity are based on those in the original Italian script, allowing the storyline to make more historical sense than usual (many Pepla were retitled for Anglo-American markets and had to use contrived narration to explain their settings). The main character of El Kabir seems to be loosely inspired by Caesarion, the son of Caesar and Cleopatra, who was murdered on the orders of Caesar Augustus. There is one rather glaring historical error as the English language script refers to the main city in the film as Alexandria, which was correctly the capital of Roman goverened Egypt, but the city seen in the film is obviously meant to be in the Cairo area (the Giza pyramids and Sphinx are seen in several scenes) and it is supposedly several days march from the sea. Having already worked on several sword and sandal films, Ferdinando Baldi provides a solid hand behind the camera here. While many of the Pepla were filmed in the scope widescreen to match their American cousins, Baldi uses a more conventional widescreen (as he would several times in the Spaghetti Western genre as well) to allow more intimacy to the dialogue scenes. The production was able to use real Egyptian locations and this gives the whole film a lot more authenticity than the usual Spanish exteriors and the deserts are filled with an impressively large cast of extras, however the battle scenes are not the priority in this dialogue based Peplum and so the combat scenes, particularly the skirmishes towards the end, are presented only as a backdrop to the main characters. The sets and constumes all look good and unlike many of the late era Pepla, Son of Cleopatra never resorts to stock footage. Composer Carlo Rustichelli	provides another strong soundtrack. American actor Mark Damon is best remembered for his horror film appearances for Roger Corman and Mario Bava, but he worked on a number of Italian films in the 1960s and having just completed a pair of unofficial El Cid sequels, was cast in his one and only Peplum role. Fortunately he is not called upon to be the traditional muscle-bound hero but is believable as a warrior and his good acting is important in this storyline heavy film - the script even allows a convincing explanation for his western appearance. A number of familiar faces crop up in the rest of the cast, including Alberto Lupo (Django spara per primo (1966)) as Caesar and Livio Lorenzon (Il terrore dei barbari (1959)) as Petronius. Director Ferdinando Baldi would soon become famous for his well written contributions to the Spaghetti Western genre and just like the unconventional Il Pistolero dell'Ave Maria, Son of Cleopatra emphasises its superbly written storyline over the more familiar action scenes. Fortunately the production does not skimp on the exteriors and the real Egyptian locations look amazing and are well populated with extras and marching armies, although the action scenes are treated as secondary to the storyline and some good potential for a gladiatoral tournament and a large scale battle at the end is wasted. This is one to recommend for fans of storyline based historical adventures. Directed by anyone	interesting? Ferdinando Baldi - an Italian director who worked in a variety of genres but is best known for his Spaghetti Westerns including Preparati La Bara (1968) and Hate Thy Neighbor (1968). Who is it for? One for fans of the more storyline based Pepla. The print is cropped at the edges, but only very slightly - the OAR is likely to be at most 1.78:1 and might even have been projected at 1.66:1 in Europe. The print has a general lack of detail with occasional damage and speckling but the colours are fine and it is certainly a lot more watchable than most fullscreen Peplum prints. Audio English mono - sounds fine, some crackling but dialogue is always clear. Availability Only available as part of a double-film release with another Egyptian Peplum, Son of Samson. Other regions? Available on DVD in Germany as 'Sohn von Caesar und Cleopatra' from E-M-S, with a better looking widescreen print but no English options. Also available in Italy as 'Il figlio di Cleopatra', listed as an anamorphic print, although no English options. Cuts? Cut status unknown, no apparent cuts. The print used is English language (the credits seem to be from another source, possibly a US TV print). A well written and good looking Peplum, although lacking in action scenes. Of interest. Poor to most viewers, but a pretty good print for anyone used to struggling through Alpha and Millcreek Peplum DVDs, it is at least only minimally cropped and the all important audio comes through well. Find our reviews of other Peplum Films and films directed by Ferdinando Baldi. All text in this review written by Timothy Young - 14th February 2011.